Whether acute or chronic, most of us have dealt with pain. In 2016, 20 percent of adults in the United States had chronic pain, and 8 percent had pain that limited at least one major life activity. These are the findings of a recent study that analyzed National Health Interview Survey data to establish the burden of pain in the U.S. and aid in the development and implementation of population-wide pain interventions. Chronic pain has been linked to restricted mobility, opioid dependency, anxiety, depression, and reduced quality of life, and chronic pain contributes to an estimated $560 billion annually in direct medical costs, lost productivity, and disability programs. The misuse of and addiction to opioids, including prescription pain relievers, heroin, and synthetic opioids (i.e., fentanyl) is a national crisis. The Centers for Disease Control and Prevention estimates that the total economic burden of prescription opioid misuse alone in the U.S. is $78.5 billion a year, including the costs of healthcare, lost productivity, and addiction treatment. Of course, physicians and other healthcare providers want to do their best for patients, but they are often conflicted because patients aren’t often truthful, or they are unable to effectively communicate their level of pain. Ultimately, healthcare providers go through an elaborate prescription checklist, with state and federal officials looking over their shoulders. The state of the art of pain measurement right now is a pain scale that was invented decades ago. However, a new University of Pittsburgh study shows that physicians may soon be able to quantify pain with a simple blood test. Researchers have developed a test that objectively measures pain biomarkers in the blood. 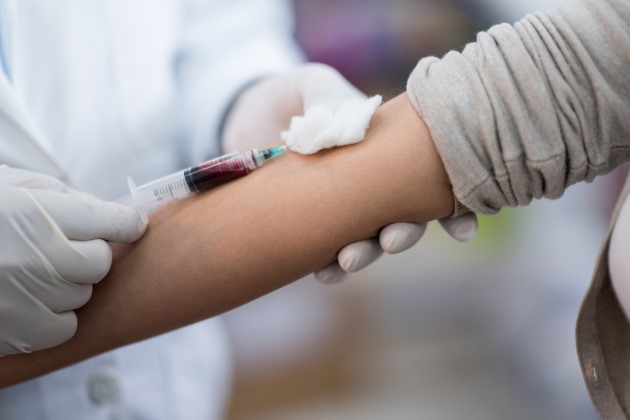 This blood test, the first of its kind, would allow physicians more accuracy in treating pain in their patients, especially those patients who could not communicate the level of intensity of their pain, such as children or elderly patients with dementia. The study, led by psychiatry professor Alexander Niculescu, MD, Ph.D., tracked hundreds of participants at the Richard L. Roudebush VA Medical Center in Indianapolis. During the study, researchers looked at biomarkers found in the blood — in this case molecules that reflect disease severity. Similar to how glucose serves as a biomarker to diabetes, these biomarkers allow doctors to assess the severity of the pain the patient is experiencing and provide treatment in an objective, quantifiable manner. According to Niculescu, the opioid epidemic occurred because addictive medications were overprescribed, likely related to the lack of objective measures of pain. The biomarker is like a fingerprint, and researchers matched it against this database to determine which compound would normalize the signature. Often the best treatment identified is a non-opioid drug or compound. Researchers found some compounds that have been used for decades to treat other things pair the best with the biomarkers. Matching biomarkers with existing medications, or natural compounds, would reduce or eliminate the need to use the opioids. Additionally, the researchers discovered biomarkers that not only match with non-addictive drugs that can treat pain but can also help predict when a patient might experience pain in the future — helping to determine if a patient is exhibiting chronic, long-term pain which might result in future emergency room visits. Given the massive negative impact of untreated pain on quality of life, the current lack of objective measures to determine appropriateness of treatment, and the severe addiction gateway potential of existing opioid-based pain medications, the importance of approaches such as those in this study are crucial and cannot be overstated.